Here is a list of the Top 10 most valuable football brands put together by Brand Finance, a leading independant brand value consultancy in the world. According to the report (please see link below) Manchester United have reclaimed their spot as the football's most valuable brand in 2015 with an estimated value of $1.2 billion. The Red Devils are the first billion dollar football brand thanks in part to the club's huge popularity in India, Southeast Asia and China. There are six clubs from England among the top ten most valuable football brands, largely due to the lucrative English Premier League TV rights deal. It is strange to see Barcelona in the lower part of the top ten table, as the club has just won the coveted treble by lifting trophies in the domestic league, the domestic cup and the UEFA Champions League. There are no Italian clubs in the top 10, but there are three ranking between the positions 11 and 20. 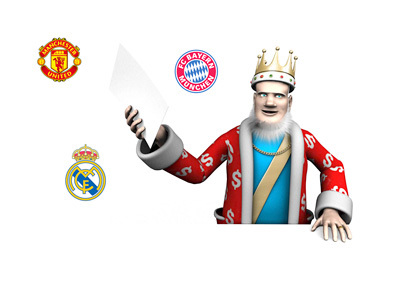 Brand Finance uses a complex formula to come up with the brand evaluation of each club. The ability to drum up popular interest is included in the calculation and so are the matchday, commercial and broadcast revenues. The two key commercial revenue streams are from kit manufacturing and shirt sponsorship.